The Jahn-Teller effect explains why certain 6 coordinated complexes undergo distortion to assume distorted octahedral (tetragonal) geometry. "This is a geometric distortion of a non-linear molecular system that reduces its symmetry and energy". This distortion is typically observed among octahedral complexes where the two axial bonds can be shorter or longer than those of the equatorial bonds. This effect can also be observed in tetrahedral compounds. This effect is dependent on the electronic state of the system. In 1937, Hermann Jahn and Edward Teller postulated a theorem stating that "stability and degeneracy are not possible simultaneously unless the molecule is a linear one," in regards to its electronic state.This leads to a break in degeneracy which stabilizes the molecule and by consequence, reduces its symmetry. Since 1937, the theorem has been revised which House-croft and Sharpe have eloquently phrased as "any non-linear molecular system in a degenerate electronic state will be unstable and will undergo distortion to form a system of lower symmetry and lower energy, thereby removing the degeneracy." This is most commonly observed with transition metal octahedral complexes, however, it can be observed in tetrahedral compounds as well. Figure 1: Jahn-Teller distortions for an octahedral complex. Figure 2: Illustration of tetragonal distortion (elongation) for an octahedral complex. This is due to the dxy and dx2−y2 orbitals having greater overlap with the ligand orbitals, resulting in the orbitals being higher in energy. Since the dx2−y2orbital is antibonding, it is expected to increase in energy due to elongation. The dxy orbital is still nonbonding, but is destabilized due to the interactions. Jahn-Teller elongations are well-documented for copper(II) octahedral compounds. A classic example is that of copper(II) fluoride as shown in Figure 3. Figure 3: Structure of octahedral copper(II) fluoride. Notice that the two axial bonds are both elongated and the four shorter equatorial bonds are the same length as each other. According the theorem, the orbital degeneracy is eliminated by distortion, making the molecule more stable based on the model presented in Figure 2. 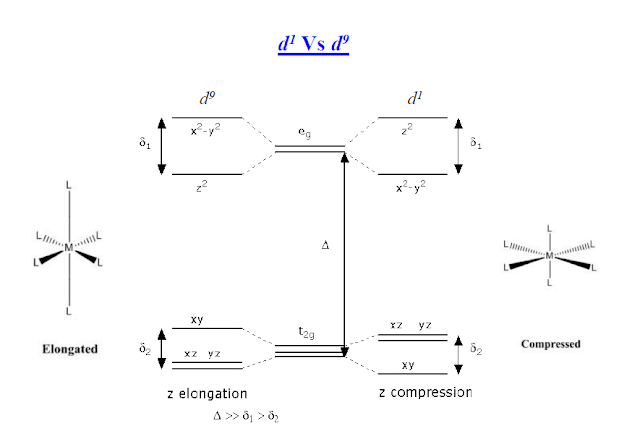 Figure 4: Illustration of tetragonal distortion (compression) for an octahedral complex. This is due to the z-component d orbitals having greater overlap with the ligand orbitals, resulting in the orbitals being higher in energy. Since the dz2 orbital is anti-bonding, it is expected to increase in energy due to compression. 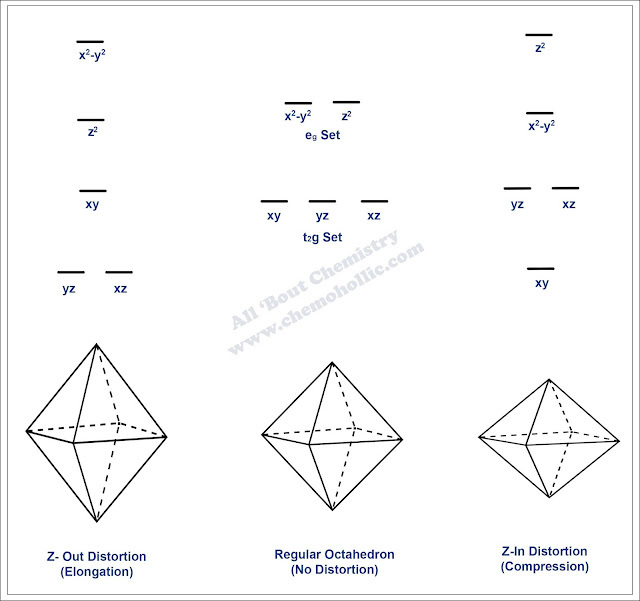 The dxz and dyz orbitals are still non-bonding, but are destabilized due to the interactions. For Jahn-Teller effects to occur in transition metals there must be degeneracy in either the t2g or eg orbitals. 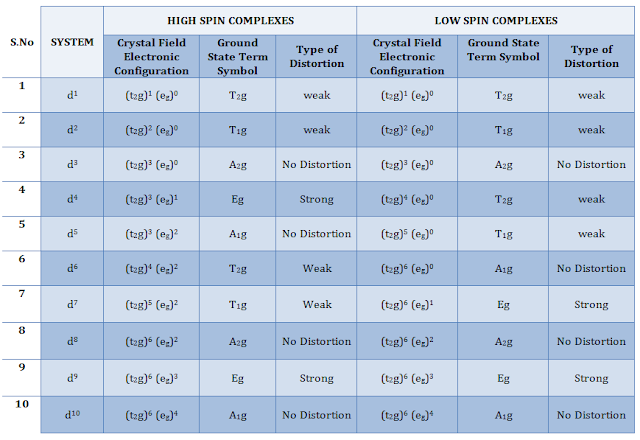 The electronic states of octahedral complexes are classified as either low spin or high spin. 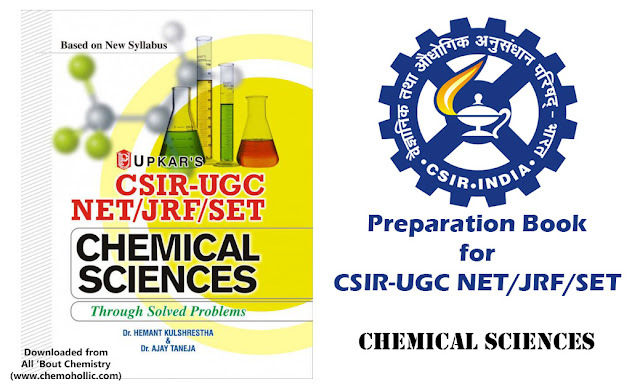 The spin of the system is dictated by the chemical environment. 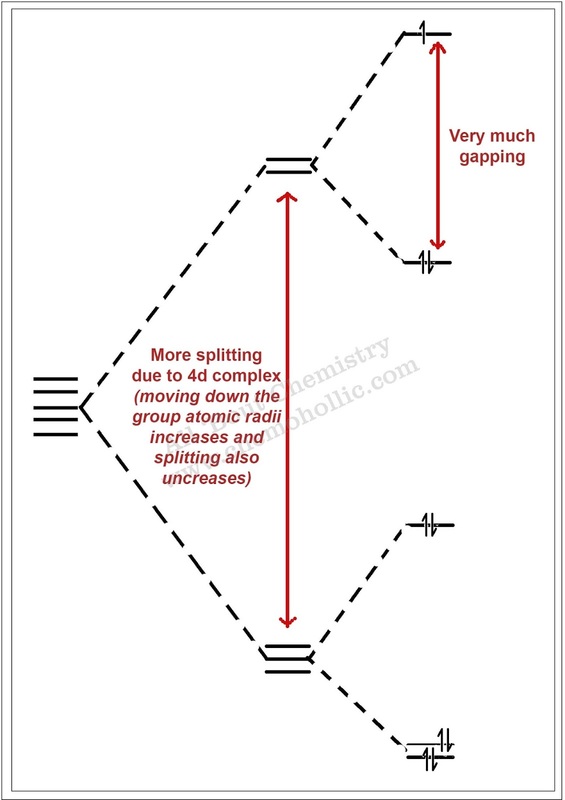 This includes the characteristics of the metal center and the types of ligands. Figure 5: Low spin octahedral coordination diagram (red indicates no degeneracies possible, thus no Jahn-Teller effects). The figure illustrates that low spin complexes with d3, d5, d8, and d10 electrons that do no exhibit Jahn-Teller distortions. These electronic configurations correspond to a variety of transition metals. Many common examples include Cr3+, Co3+, and Ni2+. The figure illustrates that low spin complexes with d3, d5, d8, and d10 electrons cannot have Jahn-Teller distortions. In general, degenerate electronic states occupying the eg orbital set tend to show stronger Jahn-Teller effects. This is primarily caused by the occupation of these high energy orbitals. Since the system is more stable with a lower energy configuration, the degeneracy of the eg set is broken, the symmetry is reduced, and occupations at lower energy orbitals occur. Figure 7: Hypothetical absorption spectra of an octahedral molecule (left) and the same molecule with Jahn-Teller elongation (right). The red arrows indicate electronic transitions. A similar phenomenon can be seen with IR and Raman vibrational spectroscopy. The number of vibrational modes for a molecule can be calculated using the 3n - 6 rule (or 3n - 5 for linear geometry) rule. If a molecule exhibits an Oh symmetry point group, it will have fewer bands than that of a Jahn-Teller distorted molecule with D4h symmetry. Thus, one could observe Jahn-Teller effects through either IR or Raman techniques. This effect can also be observed in EPR experiments as long as there is at least one unpaired electron. The Jahn-Teller Theorem predicts that distortions should occur for any degenerate state, including degeneracy of the t2g level, however distortions in bond lengths are much more distinctive when the degenerate electrons are in the eg level. The Cu2+ complexes are more stable than Zn2+ complexes due to the Jahn-Tellar distortion observed in Cu2+ complexes which is absent in the later. Au2+ disproportionate into Au3+ and Au1+ because in Au2+ one electron is present in very high energy, which easily gets removed. [Cu(en)3]2+ is Not Stable. Why? The above complex is a chelating complex of Cu2+ .This shows Jahn Tellar distortion. Cu-N bonds at axial positions try to elongate (due to JT Effect) but this elongation causes strain in the molecule. Hence the complex becomes unstable. Why do d3 complexes not show Jahn-Teller distortions? Does the spin system (high spin v. low spin) of a molecule play a role in Jahn-Teller effects? What spectroscopic method would one utilize in order to observe Jahn-Teller distortions in a diamagnetic molecule? What spectroscopic method(s) would one utilize in order to observe Jahn-Teller distortions in a paramagnetic molecule? 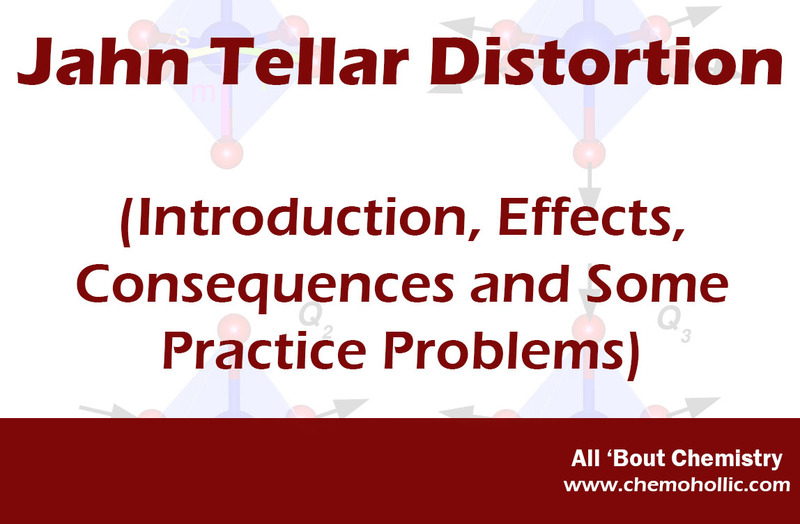 Why are Jahn-Teller effects most prevalent in inorganic (transition metal) compounds? Complexes with d3 electron configurations do not show Jahn-Teller distortions because there is no ground state degeneracy. Yes. Examining the d5 electron configuration, one finds that the high spin scenario contains all singly occupied d orbitals (no degeneracy). However, the low spin d5 electron configuration shows degeneracy, which then leads to possible Jahn-Teller effects. UV-VIS absorption spectroscopy is one of the most common techniques for observing these effects. In general, it is independent of magnetism (diamagnetic v. paramagnetic). Thus, one would see the effect in the spectrum of UV-VIS absorption analysis. Note that EPR requires at least one unpaired electron, and therefore not EPR active. 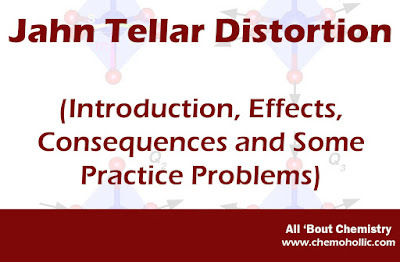 Inorganic, specifically transition metal, complexes are most prevalent in showing Jahn-Teller distortions due to the availability of d orbitals. The most common geometry that the Jahn-Teller effect is observed is in octahedral complexes (see Figures 2, 4, 5 and 6 above) due to the splitting of d orbitals into two degenerate sets. Due to stabilization, the degeneracies are removed, making a lower symmetry and lower energy molecule. In addition to UV-VIS absorption, one can also employ EPR spectroscopy if a molecule possesses and unpaired electron.